Hello there Joy Clair friends, We're hopping in to share a secret little mission with you today! Our secret will be revealed today thanks to Amanda (Christy's creative partner at Joy Clair) and her stealthy incognito skills! You see, the Design Team has been working on a secret little mission for one of the owners of Joy Clair. Just a little while back, Christy became a Grandma/Granny again! A precious little angel was born a tad early and through many prayers, fabulous medical team intervention and her loving family, this little angel grew strong and is now thriving at home! So much time for spoiling, so much time for LOVE! We (us designers) thought it would be fun to organize a little virtual party to celebrate this precious little gift from God! We created cards, prepared a party package, purchased/made special gifts and mailed everything off to Amanda...our secret agent! Right about now, we hope they're having a ball celebrating this new bundle of joy and enjoying the blessings HE has provided. Wan't a peek into our little party? We've created our own blog posts to share our card creations with you. Some of us even remembered to take photos of our gifts...Ha ha...Won't you join us in congratulating Christy on becoming a Granny again?! Thanks so much for joining us in celebrating this little gift! I started by stamping one of the houses from Dwelling Place unto my card panel. I added two windows for the top level of the house leaving the center open for my sentiment. I used copics in coordinating colors to some pattern paper that I picked to use on the cardbase. Once the coloring was done I then stamped the word home ( also from the Dwelling Place) and the word new for an older set ( New Baby). I layered the colored panel onto some black cardstock to help it stand out from the pattern paper of the base, then adhered to the card base. Once the panel was on the cardbase I took some clear Wink of Stella to the windows, to help amp up a warm glow feeling in all of the windows. Then for just a little dimension and more fun I added some clear Nuvo Drops over the windows to make them shiny! In the photo below you can see the glitter a little better, but you can see the gloss over the bottom windows really well. Next is a look my last week in September using Bright Idea and a house from the Dwelling Place from the new release. I decided to stay with a color pallet already started with the printed images on the paper, I really like the navy and coral combo. I used a house from the Dwelling Place to highlight a verse from the set. I used many images from Lightbulb Moment to add fun elements to the page and highlight special occasions, like birthdays and an anniversary. Made the stars from the set my bullet points for to dos and appointments. Lightbulb Moment will also work great for cards, scrapbook layouts and bible journaling! I'm so excited to share this shaker card with you today. You know I'm a shaker card addict, and with the newest Joy Clair Pearl of Great Price stamp set, it was clearly my go to type card. Since it's an underwater theme, I had fun playing around with a couple different techniques that created a more "loose" design. It all came together so magically; I can't wait to see what you create with the Pearl of Great Price stamp set. Start by using a large circular die cut in the center of a A2 size white cardstock as well as a same size foam sheet. I used one that was included in a shaker card kit. Make sure you keep the circle cut out as we'll be stamping on that later. Grab your Magical Shakers in your choice of colors; I chose California Poppy Gold and Time Travel Teal. Lightly sprinkle the powder over the cardstock and then spritz a little bit of water. You don't want to saturate it, just lightly mist it so that some of the color spreads. Set this aside to dry and be careful not to touch. Next, use your MISTI to stamp the water plants onto the circle using black ink, and then stamp the oyster onto another sheet of white cardstock. Using either water based markers, watercolor pencils, or water color paints, color in your plants with coordinating colors. I chose two blues for the plants and then took a watercolor brush to drag the colors outside of the lines. This is suppose to look like it's underwater, so feel free to get a little loose and messy! Then, take a little bit of pink to brush around the pearl on the oyster. I kept the rest of the oyster stamp white since there was already a lot of color and texture going on with the rest of the card. Next, using your choice sentiment from the Pearl of Great Price stamp set, stamp it onto a strip of black cardstock using white embossing powder. Now it's time to put it all together. 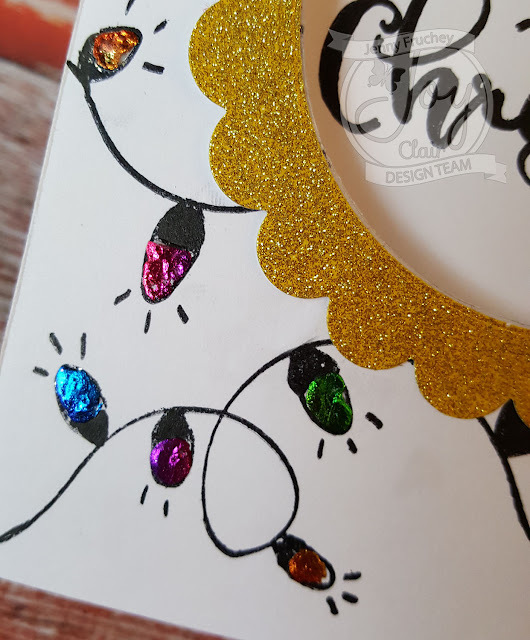 Place the foam sheet onto a card base, tape the inner circle down, add your sequins, and adhere a sheet of acetate to secure the sequins. Arrange and adhere the oyster in position, and then tape down the background sheet. Finally, adhere the sentiment to the bottom left side. Don't be afraid to mix colors and textures, and get a little crazy with your cards! I absolutely love how this underwater card came out using the Joy Clair Pearl of Great Price stamp set. Can't wait to see what you create! Hello everyone... Helen is here. Thanksgiving Day is less dan a month from today. We have Fall/Thanksgiving decoration out and enjoying the Fall weather. We give thanks to the LORD for creating this season! And today, I have a CAS - Thanksgiving card to share with you all that I created using the new released Color By Faith Stamp Set called Thankful and Blessed, and also the Broken Brick Background Stamp. 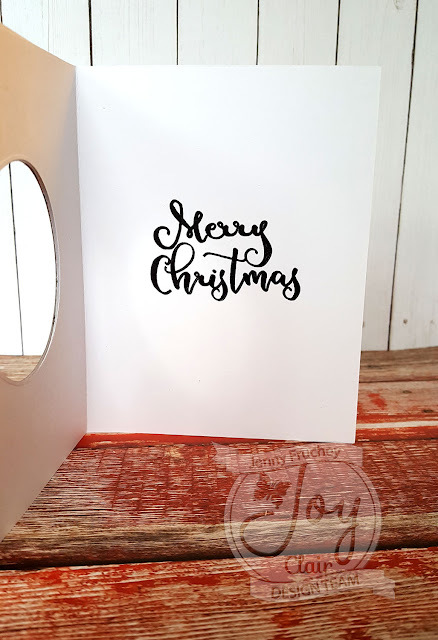 First, to create the background I stamped the Broken Brick Background Stamp on a white cardstock using Mini MISTI and with Iced Spruce Oxide Ink. After stamping, I added some of the ink on the craft mat, and picked up with wet fan brush and sprinkled some on the cardstock. I dried the background panel, then I trimmed it into 4" x 5.25", and I added it on the A2 card (4.25" x 5.5") with dries-clead adhesive glue. I stamped the sentiment on a white cardstock with VersaFine Clair Acorn and VersaFine Clair Summertime using Mini MISTI. I stamped the sentiment bit to the right side more to give the left side some room for the sunflower later. And then, I trimmed it into a banner pennant. I added it on the card with 3D foam tape. I stamped the sunflower on a white cardstock with CP Midnight Ink Pad and then I colored it with ShinHan Twin Touch alcohol markers. After that, I fussy cut it with micro-tip scissors. I colored along side of the flower with Micron Brush Black Pen for finishing touch on the flower. And then I added it on the sentiment banner pennant with dries-clear adhesive. I embellished the card with some of the clear-holographic sequins I have in my stash using dries-clear adhesive glue. That is my CAS - Thanksgiving card to share with you all today. I hope you all like it and inspire you to create with Joy Clair stamps. Thank you so much for stopping by! Jenny from Jen's Crafty Place here, participating in a Joy Clair Stamps and Therm-O-Web collaboration. I am featuring a new release of Joy Clair Stamps "Christmas Lights". It is a cool background stamp with tiny light bulbs on a string. I decided to use some of the Deco Foil by Therm-O-Web and foil all my bulbs. I love the shine the foil brings to my projects! I used the Rainbow Foil to achieve all the colored bulbs with only purchasing ONE foil pack. 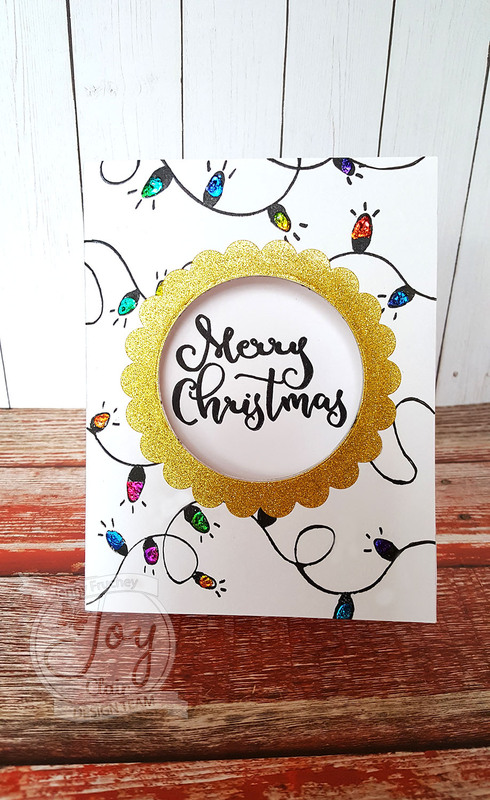 I took an A2 card and stamped the "Christmas Lights" in black in on the front. 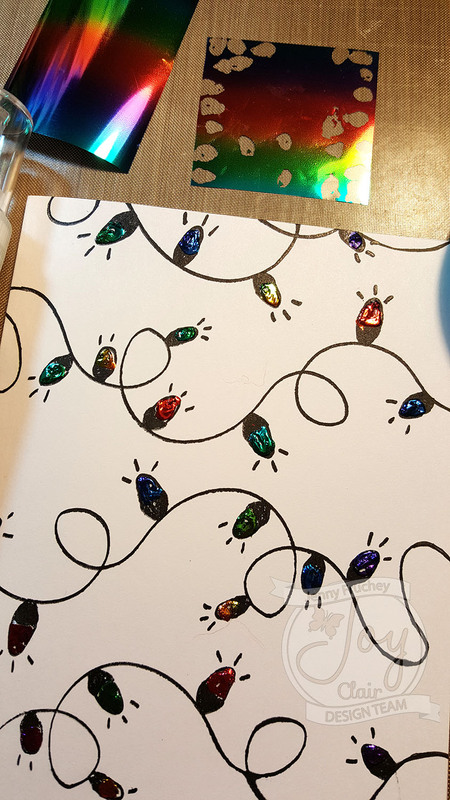 I then used the Deco Foil Adhesive to color all the bulbs. I then let it dry for about an hour. The adhesive will be clear and tacky to the touch. Then the fun part begins!! I took a tiny square of the Rainbow foil and used a section of color to place over the tacky bulb, shinny side UP. Rub gently to get the adhesive to grab hold of the foil and peel back the foil to reveal all the shinny goodness!! I continued to move my foil around to different bulbs and shifting the foil to a different color on the tiny foil sheet until all my bulbs were covered. I then selected a large Deco Frame and peeled off the release paper to reveal the adhesive and place it on the front of my card. I found a die cut circle I owned that was the same size as the opening I wanted to make and used my Sizzix to cut out the hole. 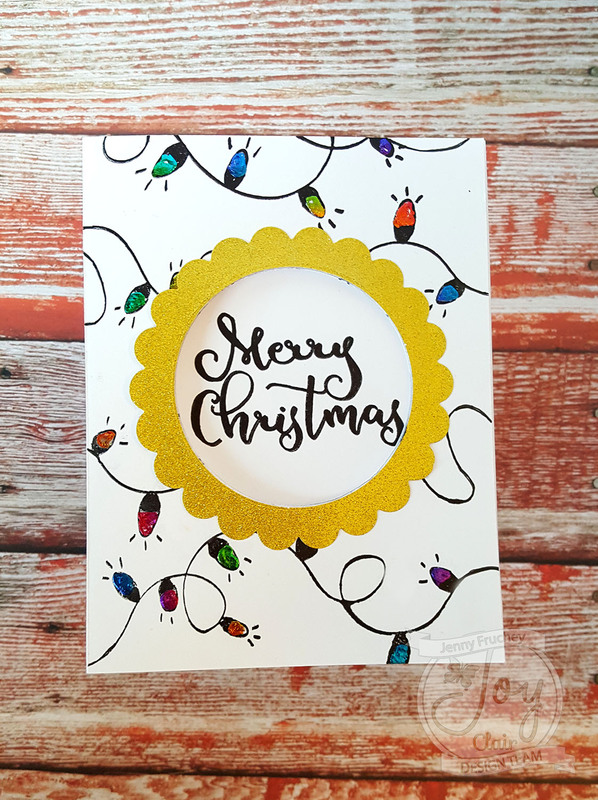 I then used the previous Christmas release of Joy Clair stamp set, "3D Christmas Poinsettia" to stamp my "Merry Christmas" sentiment inside the card where it would show though the center opening on my card front. 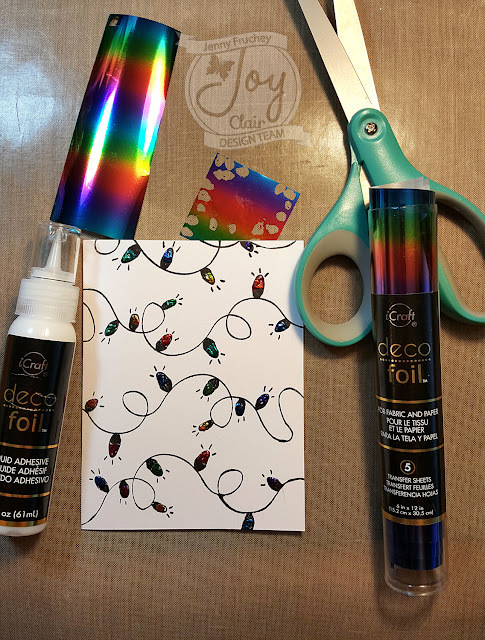 I hope you try the new Deco Foils from Therm-O-Web. They come in some fabulous colors!! A word of caution: Once you use the foil you may become addicted to it, like I did!! Thanks for joining me!! Hello everyone, Ceal here with you today! All week we are collaberating with Thermoweb to show you how amazingly well our products work together. Thermoweb has some gorgeous foils for the fall like the one I used to make the background, Gina K Designs Dazzling Orange. I love the sparkle it has to it and the perfect color for fall. To create my card I started with a white top folding card base, along with a black A2 size piece of cardstock for the mat and then an orange one for the focal panel. The stamp set I used is Thankful & Blessed. I also used the Deco Foil Transfer Gel along with a stencil. I laid the stencil on the orange panel and held it firmly with the amazing Purple Tape. Next using a palette knife and the transfer gel I spread it across the stencil. When you spread the transfer gel on, it is white and when dry and ready to foil it turns clear. While I was waiting for it to dry I cut out two different sized ovals using Nested Double Stitched Ovals. On the smallest of the ovals I stamped the greeting from the Thankful & Blessed set and then stamped the pumpkin and sunflower image also from that set on a scratch piece of cardstock, colored it using Copic markers and fussy cut it out. Once the transfer gel was completely dry I placed a sheet of the Dazzling Orange foil slightly larger over it and placed it in a parchment paper folder to run through the laminator. Hello there Joy Clair friends! 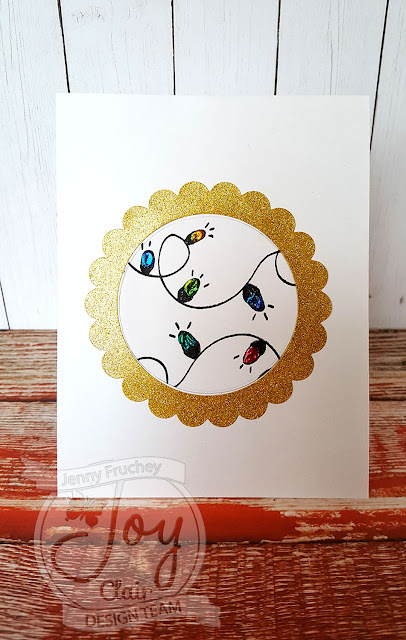 It's Kerry here and I'm here to share some yummy cards created with Joy Clair stamps and Therm-O-Web products. This was my first opportunity to play with Therm-O-Web foil and I wanted to play and explore with it. I didn't want to use the most usual stenciling and plain image transfer-and wanted to stretch my exploration a bit more beyond the traditional applications. Through my exploration, I discovered my favorite foiling technique...I'm not sure it's a well known technique, but it's one I loved to use. To create my first card (Donuts anyone? ), I applied some DecoFoil Transfer Gel to the Sprinkled with Love donut stamp and stamped all over some paper. After I let the paper dry, I foiled the image as normal in my cheap Scotch laminator. After I peeled off the foil, I set that page aside and took another piece of cardstock. I brushed some Transfer Gel onto the paper with a paintbrush and then applied the foil that I had previously used. I ran it through my machine and what came out was a gorgeous brushstroked masterpiece. I love how the rainbow foil looks distressed and you can still see the donut images. My next two cards were created using the traditional stenciling technique. I used some Transfer Gel, the Abstract Circles Stencil and the New Baby stamp set. I used my finger to apply the Transfer Gel onto the paper, then ran the paper/foil through my laminator. After I removed the foil, I added a little sentiment and stamped the cloud/rainbow and then colored it with Copics. Take a close peek at the stencil marks. Rainbow-licious! 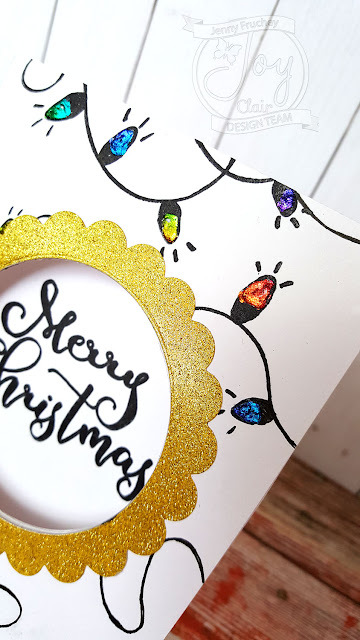 When I created this rainbow panel, I KNEW I had to add a little rainbow stamped image! The New Baby set worked PERFECTLY! Just look at that rainbow goodness!! A little tilt back and forth and you can just see it shine! Yep! It needed NOTHING else...I held restraint! I sure did! I just added some ribbon, stamped a sentiment on the inside and said THIS IS GORGEOUS! Alrighty, so now I'm in love with rainbow brushstrokes! Yep, I need to do a bit more shopping at Therm-O-Web too! Thank you for stopping by today. I hope I inspired you to think out of the box! Have fun and GO WILD!